NWO awarded more than 4 million euros to 5 innovative research projects from the faculty of Civil Engineering and Geosciences (CEG) for research into the effect of human interventions deep under the ground. The research programme DeepNL seeks to improve the fundamental understanding of deep subsurface dynamics that occur under the influence of human interventions such as gas production and geological storage of CO2. 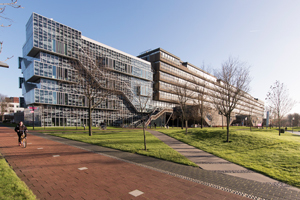 During the Geothermal Get-Together on 29 November 2018, it was announced that research on Geothermal Science and Engineering at TU Delft got another boost. A consortium of seven partners signed a certificate for sponsoring an Assistant/Associate Professor. NWO awarded more than 4 million euros to 5 innovative research projects from the faculty of Civil Engineering and Geosciences (CEG) for research into the effect of human interventions deep under the ground. Hadi Hajibeygi, assistant professor in the faculty of Civil Engineering and Geosciences has been elected Innovative Teaching Talent 2018. He lectures on the courses, Reservoir Simulation, Rock Fluid Physics and Advanced Reservoir Simulation, and set up the DARSIM research group.